Gold! GOLD! A treasure for pleasurable eating. John Rowland and Tommy Thompson, young entrepreneurs, have a vision of the great orange. They hope one day they will get a business going. 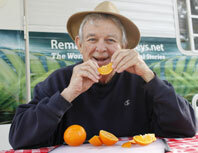 For now they are aficionados introducing great southeastern oranges to people wherever they meet them. 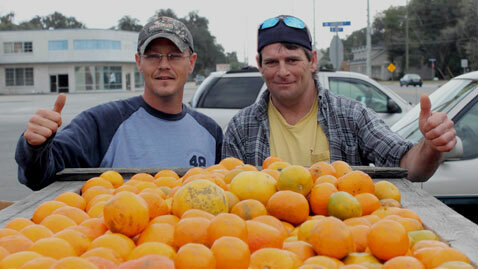 Today they were in Darien, GA with a pickup bed of American Honeybell and Pineapple-Oranges hand-picked in Haines City, Florida. Personally, after a taste test, I decided that I like Pineapple-Oranges. Sweet, pure tasting, juicy… take a bite. But believe it: Honeybells are also a juicy delectable delight preferred by many for their rare and unique taste. According to Al’s Family Farms website, as the Legend of the Honeybell goes, “several years back along the shores of the Indian River, an inspired man with vision stepped into a grove. That grove became the stage where something just short of a miracle was to occur. With his pocketknife, he carefully sliced two buds from the twigs of a Dancy Tangerine and a Duncan Grapefruit tree, gently slipping them into a slit cut deeply in the trunk of a healthy, young orange tree. 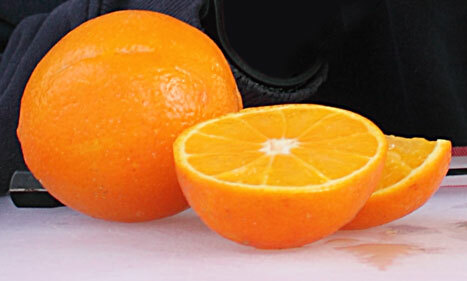 So next time ask for Honeybells or even Pineapple Oranges if you want a unique taste sensation! Mighty Good. Thanks, you guys. Makes me want to run to the store and buy a bag of oranges. Too bad I can’t get them fresh off the truck like you did.